Ready-to-use Disaster Recovery and Migration as a Service Solution. Sophisticated customer portal and billing. is now available for automated migrations of any types of workloads to Amazon Web Services. Contact our Sales Team for Demo. Migrate workloads to private or public clouds in real-time and without stopping production. Amazon Web Services, Microsoft Azure, Google Cloud Platform, Alibaba Cloud, VMware, Hyper-V, OpenStack, Oracle Cloud, KVM, Bare Metal are fully supported. Sophisticated Disaster Recovery for Private and Public Clouds. Protect VMware, Hyper-V, OpenStack or Public Clouds Infrastructure. Hystax Acura – a fully-automated Live Cloud Migration and Disaster Recovery solution for private, public and hybrid clouds and business applications. The solution provides enterprise-grade consistent replication from any source platform, automated instant P2V / V2V transformation and orchestrated launch of business applications on a target or failover cloud. 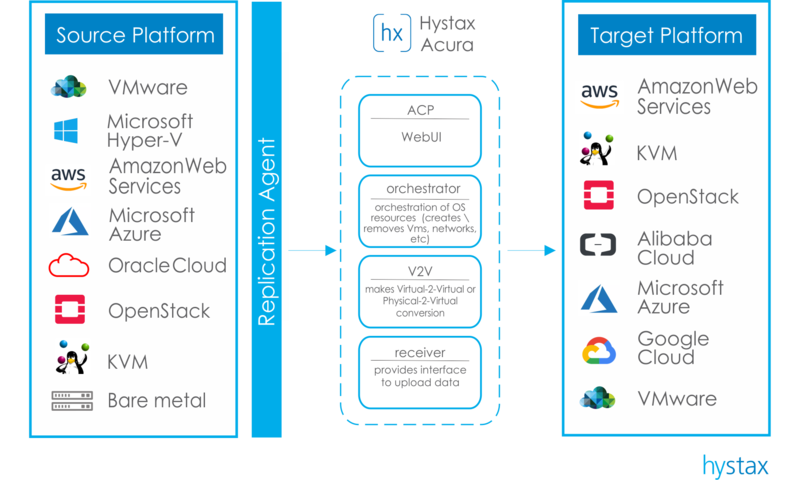 Hystax Acura supports Amazon Web Services, Microsoft Azure, Google Cloud Platform, Alibaba Cloud, VMware, Hyper-V, OpenStack, Oracle Cloud, KVM, Bare Metal. A fully-automated live cloud migration solution with consistent replication of any types of workloads, ability to run unlimited number of test migrations and orchestrated launch of business applications on a target site. Hystax Acura Live Migration is fully isolated and conforms with enterprise security standards. Live Migration to AWS solution is available on AWS Marketplace. Hystax Acura provides enterprise-grade RPO and RTO values for consistent business application replication and cross-hypervisor Disaster Recovery to OpenStack / KVM and Amazon Web Services. Partner and customer management portal and sophisticated billing are supported for any cloud. First Disaster Recovery solution with native integration with KVM / OpenStack and Best-in-Class RTO on AWS. Hystax Acura stores replicas of individual machines or the whole business application in a cold or hot storage in a deduplicated and resilient way. Flexible retention policies and pp to 70% of deduplication ratio is available. Hystax Acura Live Migration provides a smart, efficient, cost-effective and fully automated response to the growing cloud adoption, which helps companies to switch from CAPEX to OPEX cost models, get rid of TCO and cloud vendor lock-in. 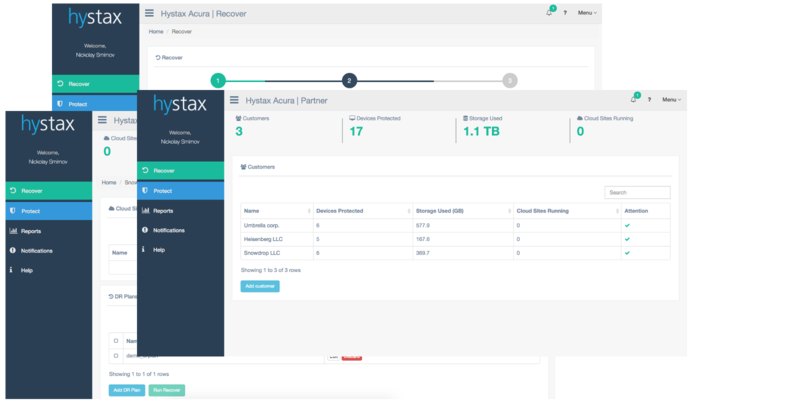 Hystax Acura is a cloud-native Disaster Recovery solution with Best-In-Class RPO and RTO with consistent replication and storage-agnostic snapshots. P2V / V2V and orchestration functionality is fully-automated. Hystax Acura is available for end customers and partners in a form of Disaster Recovery as a Service platform, On-premise Disaster Recovery and Cloud Backup solution. Hystax Acura Live Migration Case Study. Successful partnership agreement was signed by Hystax and CloudAk Middle East.